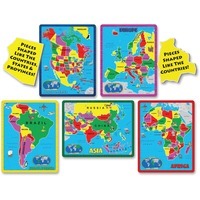 Continent Puzzle Combo Pack includes five continents North America, South America, Europe, Asia and Africa. Since the pieces are actually shaped like the countries, states and provinces of each continent, a child cannot complete these puzzles without figuring out where they are all located. Build the puzzles and learn the world. Numerous illustrations designate famous landmarks and indigenous animals to entertain while increasing the educational experience. The puzzles are framed for good portability, convenient storage and a quick learning experience. With a frame outlining each continent, children can get right to work on solving all the countries. Educational puzzles are designed for children ages 8 and up.